With the BASF 6106 I have been able to format normal 2D/DD (360 KByte) disks on one side (SS) with Norton Safe Format with 180 KByte as well as with 160 KByte. A subsequent surface scan did not detect any bad sectors. FAT and the like were also fine. However, formatting with the DOS command format did not work. There was always the message: Parameter not compatible. The command is actually: format b: / 1 / N: 9 / T: 40. In place of / N and / T one can only use / F: 180; does not work here either! Do not be surprised about the date. For a retro PC, the year 1988 fits better :-). In conclusion, I can only say that the revival of a 38-year-old floppy disk drive (1980) has performed well. I was amazed at the result itself. Today I have once again brought out the BASF 6106 and connected it to my IBM XT 5160 with PC-DOS 3.30. Formatting with FORMAT works fine: FORMAT A: /1 /8 or /1 /9. When formatting (single sided, 8 sectors/track) with FORMAT or NORTON SF I noticed that FORMAT A: /8 does not write any information into the boot record. NORTON SF does this! 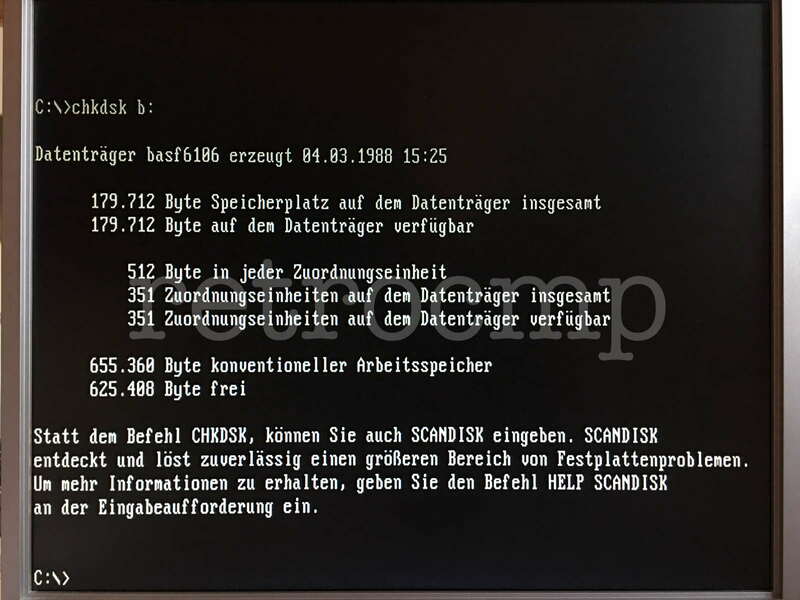 The format with 8 sectors/track is the first DOS disk format with only 160 KByte and one-sided. 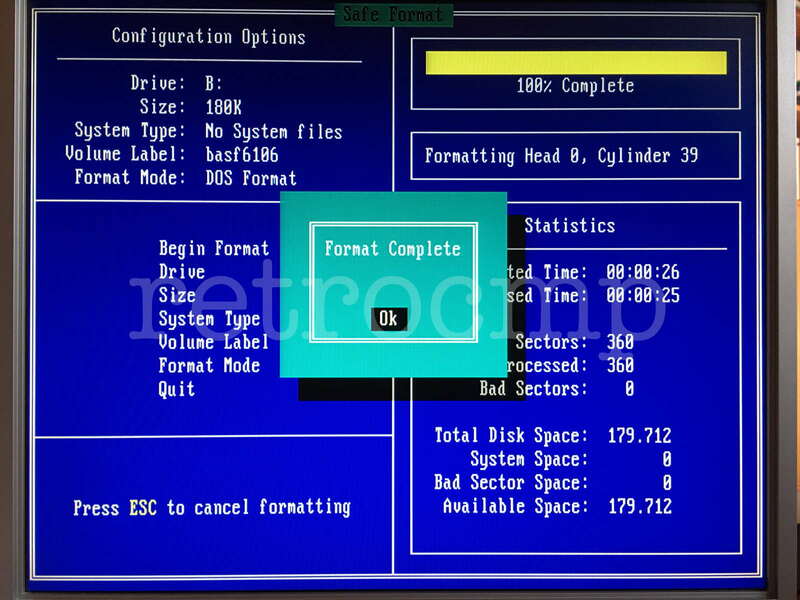 The format with 8 sectors per track is only required for the very old PC-DOS 1.0 and 1.1 versions. With these versions no information has been written into the BPB (BIOS Parameter Block). This started with version 2.0 [np89, p. 108]. I can't believe it, but the BASF 6106 is almost forty years old and it works perfectly. I also have a similar drive from Siemens. It runs like a Swiss clockwork, is very quiet and looks like new. I have connected the BASF 6106 to the MFM controller, entered no FDDs in the BIOS and ... The 6106 is properly recognized as drive A :. Formatting with Norton Safe Format and DOS format works perfectly. 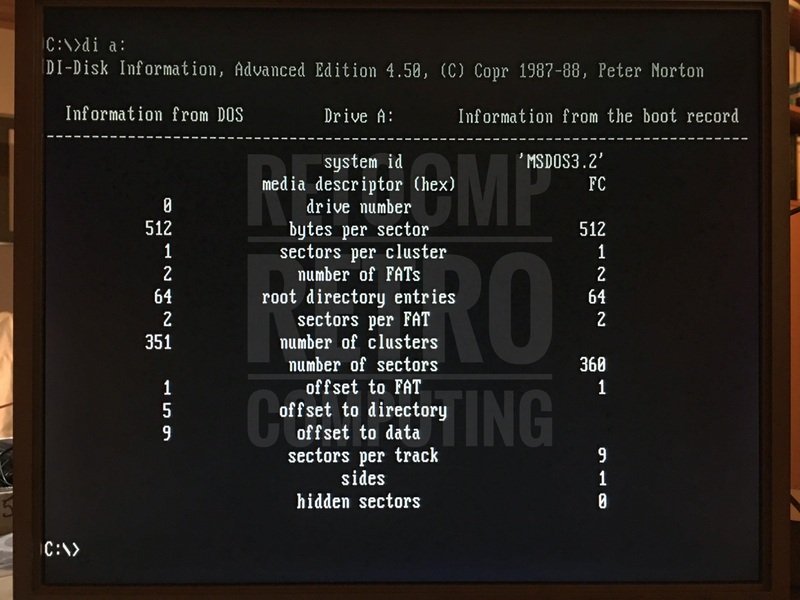 The DOS commands format recognizes under version 3.20 even without further parameters the correct capacity, namely 180 KByte. The media descriptor is correct with FCh, indicating 180 KByte capacity. Again, all information is correct.